Nikki Sixx is bringing the “best rock on the radio” into Best Buy stores. 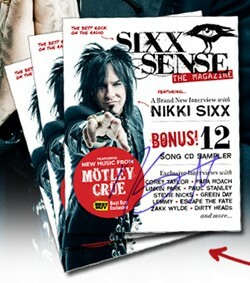 The Motley Crue bassist’s Sixx Sense branded mini-magazine can be seen at the Sixx Sense Rock displays in 700 Best Buy stores across the country. ‘The Sixx Sense: The Magazine’ features more than 40 pages of exclusive content from the radio show, new interviews with Nikki Sixx, Kerri Kasem, today’s most relevant music artists, and much more. The magazine will also be available for purchase on www.BestBuy.com starting November 19 through 2012. In July 2012, exclusive Sixx Sense Rock displays featuring a selection of rock albums curated in collaboration with Nikki Sixx debuted in Best Buy stores nationwide. Since then, a select album from the display has been highlighted on Sixx Sense with Nikki Sixx and www.SixxSense.com at a special price each week, and consumers have been given the chance to enter contests and win concert tickets, including a flyaway experience to see The Tour, featuring Motley Crue and KISS.